The renowned journal the Legal Intelligencer recently revisited an embarrassing industry topic in an article entitled “Why Do Pennsylvania’s Courts Suffer From Chronic Scandal?” While the author included its numerous infamous scandals as evidence, they fell short in answering their own question. It is answered here. The failure to remedy the situation itself speaks volumes, with an obvious aversion to interfering with the status quo… the reason is simple and not unique to Pennsylvania. 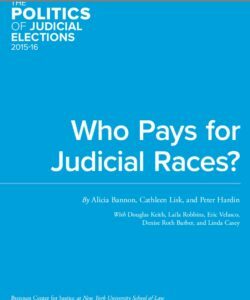 The legal industry is by far the largest source of political campaign funding and it is dependent upon the judiciary for generating those funds. Money laundering is not just the concealment of drug money in overseas bank accounts or sham businesses, it is any illegitimate generation of profit masked to appear as legitimate. These law firms are not just being generous; it is not their money that lawyers are contributing to these election campaigns. It is personal assets being extorted through the criminal and civil courts, whose laws and rules have gone through decades of manipulation just for that purpose. Not only has the system been redesigned specifically to launder money, but the mechanisms for remedies have been deliberately removed. Law firms fund judges specifically to facilitate the money laundering process. They are rigging cases not only for specific outcomes, but allowing needless complication and protraction of litigation garnering law firms exorbitant hourly fees. In addition to the fees being completely unregulated, they can bill for as many hours per day as they like- with unchecked overhead that no other industry could get away with inflicting on consumers. But it is the legal industry that controls the law-making. The fruits of their deception is split between campaign coffers and their wallets. There are several components to this synchronized crime. One is that not one government agency is responsible for protecting the public against judicial corruption. Not the FBI, not the State or U.S. Attorney Generals, not the District Attorneys nor the Department of Justice, and certainly not the Judicial Conduct Board. The latter has never removed a judge for a crime against an individual in the state of Pennsylvania. They will take absolutely no action if an individual submits a complaint that a court official has stolen from them. It is a complete black hole – a void in the structure of our government . The only time one of those agencies will take action is if their cash cow- the government that pays their salaries- is being cheated out of money. It is by design and perfectly acceptable, if not legal, for judges to abuse their power and steal from you. If you cannot believe this, then please test the system yourself. The Intelligencer noted that “Pennsylvania has the dubious distinction of being home to one of the most notorious judicial crimes in U.S. history. But five years after the masterminds behind the “kids-for-cash” scandal went to prison, the state’s courts have continued to struggle with corruption and misconduct on the bench.” The reality is that it is not really a “struggle” with judicial integrity, as much as it is an effort to protect a self-appointed privileged class, and the “kids for cash” are far from being the only casualties. The divorce courts are a particularly sinister target, having ballooned into a $2 billion a year industry in Pennsylvania alone, through which they engineer foreclosures, garnering hefty revenue for foreclosure mill law firms, that are huge contributors to the political arena. Recently, attention has been brought to civil forfeitures that having subversively been going on for decades, where savings, cars and homes are being taken from people who were charged, but never convicted of any crimes. Often the property is taken from family members who are not even a party to the alleged crime, but the courts refuse to return their property even when charges are dropped. In one incident a party in family court was ordered by the judge to hire a lawyer. They then had all of the contents of their home removed by a Sheriff, for this lawyer who claimed they were owed fees. After all of the property was removed, it was never inventoried, valued at zero, and the judge then allowed a foreclosure on the home to proceed for a monetary amount that was far below the value of the house. The ruthlessness of it has to be experienced to be believed, but in Pennsylvania this is all quite rampant. Innocent people are being bankrupted and left homeless. Even Governor Tom Wolf is a spoke in the wheel. He has been suspiciously silent during the multiple judicial scandals that have plagued his administration, such as the Porngate fiasco that resulted in two Supreme Court Justices having to resign. He is also well-aware that civil forfeitures and the family court system are being used by court employees to illegally confiscate personal property. But he is not about to rock the boat. Although Wolf has touted himself as having funded his own political campaign- that is far from true. Public records show that while Wolf did contribute $10,012,163 of his own inherited wealth, his next largest source was lawyers, having given him $3,054,629 in funds. Wolf, a Democrat, received $600,000 from the Committee for a Better Tomorrow, which is actually the Trial Lawyers Association and $50,000 from the Commonwealth Heritage Fund which is a secret PAC run by the family law firm of Republican Senator Stewart Greenleaf. While Governor Wolf has claimed he has no authority over the Judicial Branch, this is untrue. One Governor, Milton Shapp, did try to do something about the court corruption. There was a massive cleanup with many public officials indicted when he came into office, but he was obstructed from implementing permanent safeguards. After the 1968 disasterous amending of the state constitution with Article V Section 10(c), giving the Judicial Branch complete autonomy, he saw that it was a train wreck waiting to happen. Shapp passed an Act in 1978 (42 PA 1703), that mandated the Judiciary open its meetings to the public. But the Judiciary overpowered Shapp, with an unconstitutional move, by unilaterally repealing the Act in a letter, to avoid public scrutiny. During that same era, the Judiciary also exempted itself from review of its court rules (42 PA 1702), that facilitated a large part of the money laundering, under a law that previously mandated the Attorney General review all agency regulations for constitutionality. Of course, any bill that would threaten the legal industry will have those components removed or not even make it to a vote – thanks to Senator Greenleaf who has been Chair of the Judiciary Committee for over thirty years, and filters everything the Committee sees. He has more power than the Governor, is completely funded by law firms, and his family law firm has lucrative contracts from the Judiciary. He also wrote the disasterous money-making Domestic Relations Code. Greenleaf is the poster- child for the need for term limits, especially on Committee Chairs. A suggestion was also made for a bill prohibiting lawyers and law firms from contributing to judicial campaigns. Obviously neither will ever see the light of day with Greenleaf at the helm. He is either in denial or arrogant, as he knows full well, as do thousands of victims of judicial criminality, that the corruption is not from “outliers” – it is systemic organized crime. The pay off is hands-off regulation of the legal industry with the expectation that the firms will give sizeable contributions into the political machine. In return they are allowed to unabashedly abuse anyone that wanders into their culture of collusion. 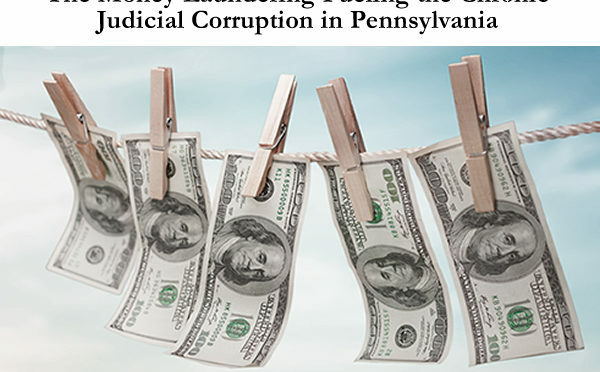 The only regulatory agency responsible, the Pennsylvania Judicial Conduct Board, has no mechanism for restitution for losses that result from judicial misconduct. The sham of a Judicial Conduct Board was inserted into the Constitution in 1993, with a very deceptive ballot description, written by none other than Senator Greenleaf among others. It more closer resemble ‘omerta” with its operations to be held in secrecy, than anything close to a democratic organization. The Board needs to be terminated and an Office of Inspector General instituted with its leadership having no relationships with the legal industry. Although the Interbranch Commission on Juvenile Justice that was formed after the Kids for Cash scandal – vehemently recommended they issue report cards on judges, they have refused to do so. The citizens of Pennsylvania have been forced to blindly vote in judicial retention elections knowing absolutely nothing about the integrity or performance of judges. Everything about the state is geered to uphold and protect government corruption. As the saying goes, to solve a problem one has to look at who benefits from it- not who suffers from it. The latter are the thousands of innocent people that have lost their life’s savings and their homes through the criminal and civil courts, far out-numbering the “kids for cash” victims. Those that benefit from it are not just the ones that are being caught abusing their power. You could say they are just the “fall guys.” As it stands now, the Pennsylvania Judicial System is just a feeding frenzy on all who enter its house of cards.